This is one of the most creative, important big band compositions ever written by anyone! It is also a chart which has been in demand for many years. Exactly as recorded by Chris Conner with the Stan Kenton Orchestra, this moody, brilliant arrangement is a perfect vehicle for your vocalist. Russo always created wonderfully interesting (and challenging) arrangements of standard tunes. 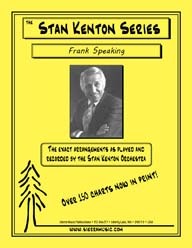 The Stan Kenton Orchestra was always an ideal showcase for the outstanding soloists within its ranks. In 1953, Kenton recorded an album titled Sketches on Standards. The Stan Kenton Orchestra was always an ideal showcase for the outstanding soloists within its ranks. As recorded by the Stan Kenton Orchestra on Sketches on Standards, this is a wonderful, creative arrangement of a great standard.